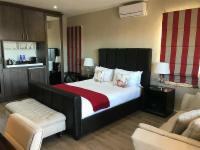 Nautilus Guesthouse is situated in the seaside suburb of Bluewater Bay, which is located midway between the Friendly City of Port Elizabeth and The Port of Coega. The guest house features generously spaced rooms decorated with beautiful wooden furniture. 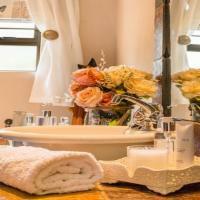 The rooms contain modern en-suite bathrooms with bath and shower facilities. 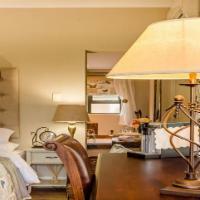 All rooms have private entrances and first-floor rooms offer balconies with panoramic views of Algoa Bay. 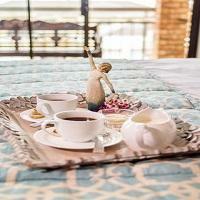 The rooms are well-equipped to cater to every need of the weary traveller. Take a short stroll to the beach or lounge next to the sparkling pool. Start your day with a fresh cup of coffee or juice and a variety of scrumptious breakfast options. The location and quick access to the N2 make the venue the ideal choice for business or holiday accommodation. Some of the best tourist attractions the Eastern Cape has to offer is only a short drive away. Stay in comfort and enjoy the panoramic ocean views of Bluewater Beach. Rates are per room. Rates include; breakfast, value added tax, and tourism levy. Rates are subject to change without prior notification. Pets are allowed only if arrangements are made with management prior to arrival. Family Unit Sleeps 4 Includes: B & B Our sunlit room is decorated with beautiful wooden furniture and equipped with flat-screen TVs and DSTV. Ground Corner Room Sleeps 3 Includes: B & B Street facing Ground floor en-suite room with a Queen size bed and a sleeper sofa for a child. I just loved everything peaceful quiet. Nd safe. Owner communicate at all times. Breakfast was ready serve although he loss his grandson. Deepest sympathy to him and family. May the lord heal you of the loss. May he rest in peace Amen. Nautilus Guesthouse is 11.1km from the centre of Port Elizabeth , the nearest airport 15.2km (Port Elizabeth Airport).